After a long, long, cool spring our local strawberries are finally ripe! We're lucky to live about 1/2 mile from a berry farm. It's called the Berry Farmer. We have the choice to pick or pick-up already picked berries. While picking is fun, I must confess while I did stop by pick berries with my dad last week, I stopped for a few already picked berries yesterday. The fruit is incredible. So juicy, and flavorful. I can go either way with shortcake. Biscuit or spongecake. For biscuit-style, I've used the same recipe for many years. It's easy and really good. I've adapted a recipe from the Longswamp Bed and Breakfast's in Mertztown, PA.
Clean the berries and slice as desired. Sprinkle with 1/2 cup sugar and liqueur. Gently mix, then cover and allow the mixture to rest for at least one hour. The sugar will help the berries release their juices. Preheat your oven to 425 degrees F. Make sure oven rack is in the center. Line a baking sheet with parchment paper (or grease the baking sheet). In a large bowl combine the dry ingredients. Whisk with a fork or whisk to mix completely. In another bowl, whisk together the wet ingredients. Add the wet to the dry ingredients. Fold together gently being careful not to overmix. Using an ice cream scoop or large spoon, dry biscuit dough on to the baking sheet. You should have approximately twelve shortcakes. Place baking sheet in oven. Bake for 10-12 minutes or until the shortcakes are golden brown. Pay careful attention that the bottoms to not over bake and become too dark. While the biscuits are baking, add the remaining sugar to the cream. Whip the heavy cream to medium/firm peaks. Be sure your whisk or mixer, and cream are very cool. To assemble, slice shortcakes across. Place a dollop of whipped cream on the bottom half. Top with sliced berries. Add more cream and the top of the shortcake and enjoy! Emergency subject change! As I was taking the photos of the shortcakes, I saw something moving out of the corner of my eye. I looked up and found these two looking back a me through the window. 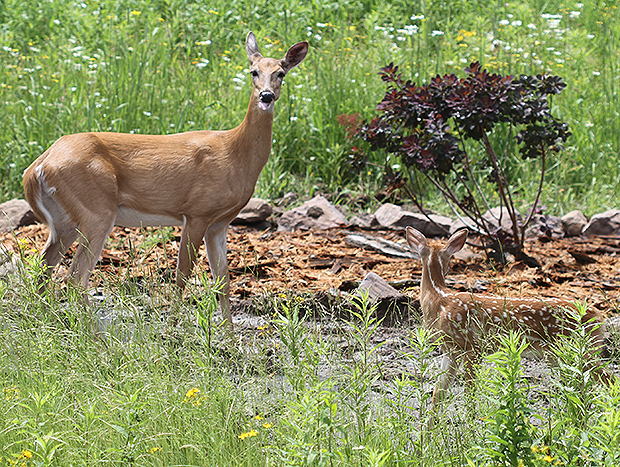 I quickly took my camera off the tripod and got a few shots of my visitors. 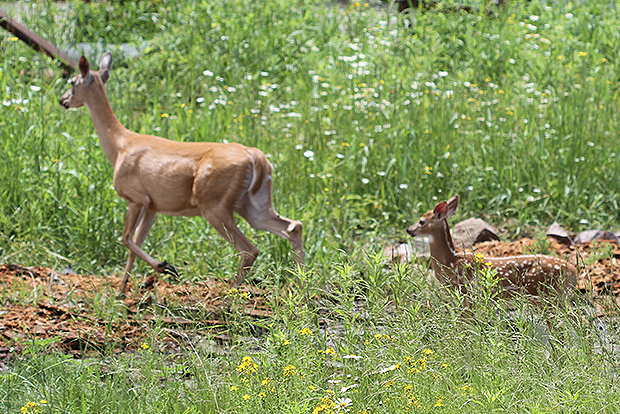 After I took a few photos, she walked over to the fawn, appeared to whisper something, then off they went. Next adventure. Now back to the shortcakes. 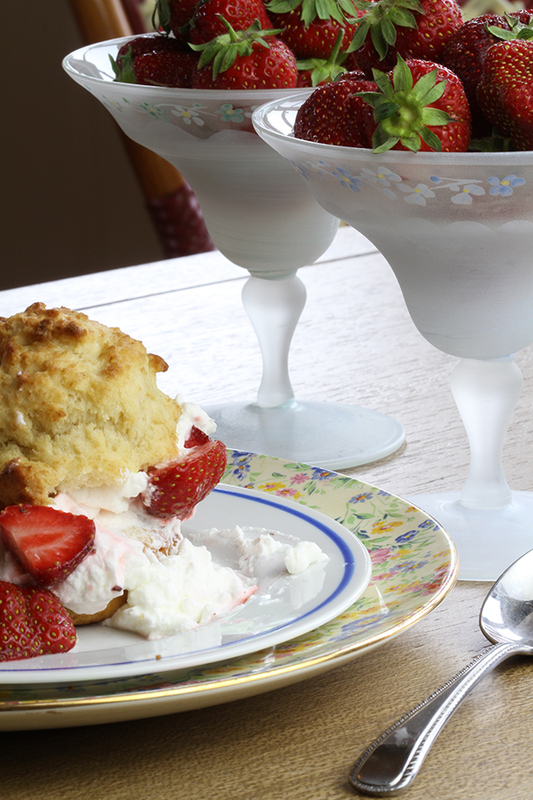 When you're ready to whip the cream, I have a few tips for whipping cream. First, start with fresh, cold heavy cream. Add the sugar and start whisking slowly. Whisk in circles, with the whisk coming out of the cream to complete the circle, so you're putting air into the cream. In the photo below are two of my favorite whisks. The smaller one is a "worker" whisk. It's great for mixing or whipping. The bigger whisk is called a balloon whisk. Look how big it is! It's for whipping cream and eggs whites. It's easiest if you choke up on the handle, and make big circles in the cream. If you're using a mixer, either a hand mixer or stand mixer, stop whipping the cream when it starts to make soft peaks, then finish whipping the cream by hand with a whisk. The cream will have a much nicer texture, and will be more stable. I hope you enjoy this recipe as much as we do. Happy berry season from Wisconsin! The only thing better than fresh strawberries might be... fresh blueberries! Can't wait. Be safe, and be kind.